Around 170 young footballers enjoyed a brilliant weekend of football played in glorious conditions on the Picky Outfield on Saturday and Sunday 3/4 September. 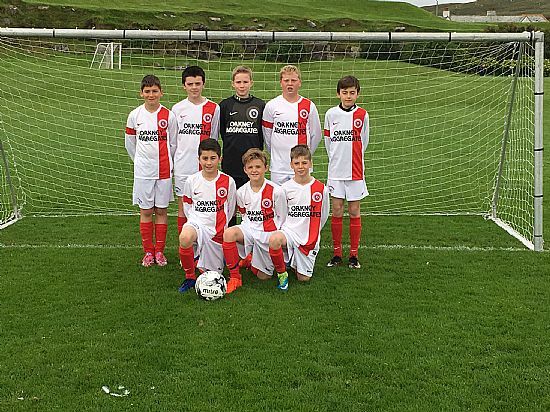 The local clubs were joined by 8 teams representing visiting Shetland sides Lerwick Rangers, TSB and Whitedale representing the largest travelling contingent for this annual Under 12’s competition. 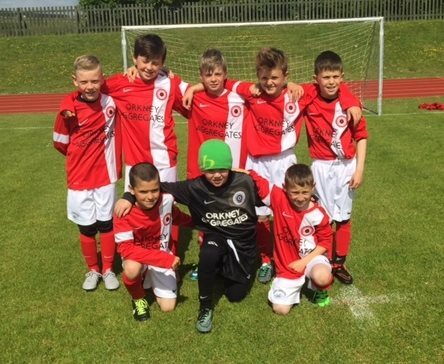 Two competitive leagues were played with some very closely fought matches resulting in a large number of drawn games and single goal victories. After 10 hours of football it was East United who emerged as the winners of both the leagues with neither of their teams having lost a match over the course of the two days. In the A League East United edged out visitors Lerwick Rangers by a single point with Dounby being the only team to take points of the East side holding them to a 0-0 draw. In the match between the two leading teams East beat Lerwick Rangers 2-0. The B league was also tightly fought with a number of teams in contention until the final few games. With 3 matches to be played East United B, Thorfinn B and Whitedale B were locked together on 19 points. Whitedale lost their three final matches while Thorfinn were held to draws in their final two matches, while East won their final matches to secure a deserved victory. 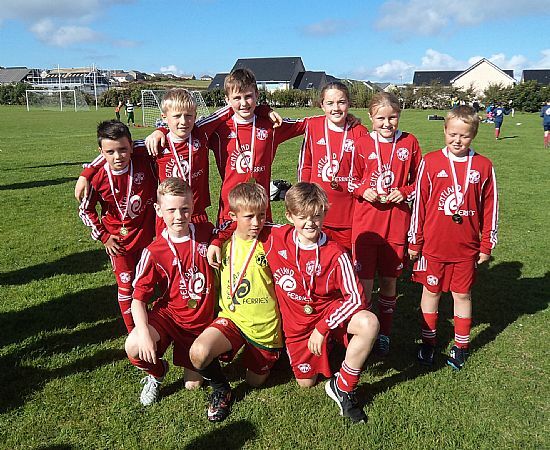 Stromness B had a good second day winning all five of their matches to edge ahead of Thorfinn into second place. At the end of the competition Roddy Mackay representing OYDG thanked the visiting Shetland teams for travelling down and contributing to such an enjoyable competition before Graeme Harrison presented the winners medals to the two winning East United teams. Whitedale A 0 TSB A 0; Dounby A 3 Thorfinn A 0; East Utd A 3 TSB A 1; Thorfinn A 0 Whitedale A 1; Dounby A 0 Lerwick Rangers A 1; Lerwick Rangers A 0 East Utd A 2; Thorfinn A 0 Lerwick Rangers A 2; East Utd A 0 Dounby A 0; Dounby A 2 TSB A 0; Whitedale A 0 East Utd A 1; Whitedale A 0 Lerwick Rangers A 1; Dounby A 1 Whitedale A 0; TSB A 0 Thorfinn A 1; Thorfinn A 0 East Utd A 3; Lerwick Rangers A 6 TSB A 1. Thorfinn C 0 TSB B 0; Lerwick Rangers B 2 Stromness B 0; Lerwick Rangers C 3 Thorfinn C 0; TSB B 2 Whitedale C 0; Thorfinn B 1 Whitedale B 0; Whitedale C 0 Lerwick Rangers C 4; Whitedale B 1 TSB B 0; Thorfinn C 0 Whitedale C 1; Lerwick Rangers C 1 Whitedale B 2; TSB B 1 Lerwick Rangers B 1; Whitedale B 2 Thorfinn C 1; Lerwick Rangers B 0 Lerwick Rangers C 1; Whitedale B 2 Whitedale C 0; Lerwick Rangers B 5 Thorfinn C 1; East Utd B 0 East Utd C 0; Whitedale C 0 Thorfinn B 3; Whitedale B 0 Dounby B 0; Stromness B 0 East Utd B 1; Dounby B 1, Lerwick Rangers B 0; East Utd C 1 Stromness B 2; East Utd B 0 Dounby B 0; Lerwick Rangers B 0 Thorfinn B 0; Dounby B 0 East Utd C 0; Thorfinn B 0 East Utd B 1; Stromness B 0 Dounby B 1; East Utd C 0 Thorfinn B 3; East Utd B 2 TSB B 0; Stromness B 1 Thorfinn B 1; East Utd B 0 Lerwick Rangers C 0; Whitedale C 0 Lerwick Rangers B 2; Thorfinn C 0 East Utd B 5; Lerwick Rangers B 1 Whitedale B 1; East Utd B 3 Whitedale C 0; East Utd C 1 Thorfinn C 0; Whitedale B 0 East Utd B 2; Whitedale C 0 East Utd C 2; East Utd B 2 Lerwick Rangers B 0; East Utd C 1 Whitedale B 0; Stromness B 2 Whitedale C 0; Lerwick Rangers B 2 East Utd C 1; Whitedale C0 Dounby B 1; East Utd C 0 TSB B 3; Thorfinn B 1 Dounby B 0; TSB B 0 Stromness B 1; Lerwick Rangers C 1 East Utd C 0; Dounby B 0 TSB B 0; Stromness B 1 Lerwick Rangers C 0; TSB B 0 Thorfinn B 1; Lerwick Rangers C 0 Dounby B 1; Thorfinn C 0 Stromness B 2; Thorfinn B 0 Lerwick Rangers C 0; Dounby B 1 Thorfinn C 1; Lerwick Rangers C 1 TSB B 0; Thorfinn C 0 Thorfinn B 0; Whitedale B 0 Stromness B 1. On the Sunday 28th August three Orkney Teams competed with seven Shetland Teams for the Andromeda Cup. Kirkwall Red’s were drawn in Group 1 against Lerwick Rangers, TSB, Lerwick Thistle & North Isles. 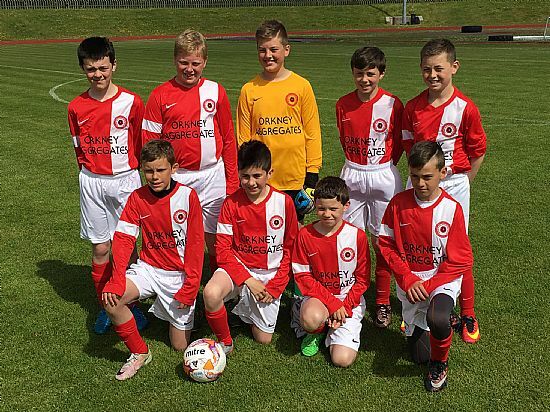 In their first match they played Lerwick Rangers and won 2-0 thanks to goals from Archie Aitkinson and Jason Scott. Next up was Lerwick Thistle with the Red’s winning 6-0 with goals from Jamie Barber (3), Archie Aitkinson and Christopher Scott. The Red’s then defeated TSB 3-0, with goals from Nairn Hall, Ewan Stevenson and Archie Aitkinson. 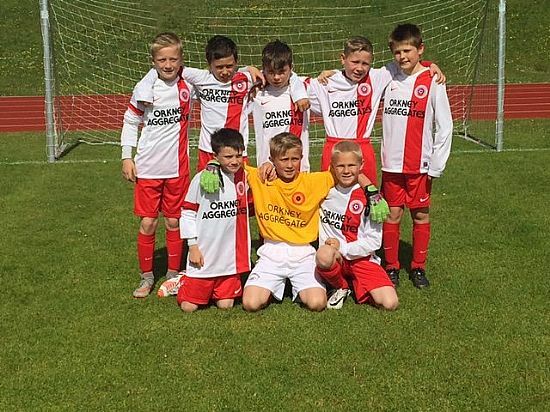 They went on to play the North Isles in their last match winning 1-0 with the goal from Archie Aitkinson and in the process topping the group to qualify for the semi-finals. In Group 2, Orkney Whites and Orkney Yellows were drawn in the same group along with Ness United, Lerwick Spurs and Whitedale. Orkney Yellows kicked off the group with a 2-0 win against Ness United with goals from Liam Smart & Ewan Foubister. Orkney Yellows then lost 1-0 against Spurs although were unlucky not to score. Orkney Whites started against Whitedale and won 2-0 with the goals coming from Scott Rosie and Jamie Tulloch. Orkney Whites then defeated Ness United 2-0 with goals from Erlend Ballantyne and Harry Field. The two Orkney teams then met each other with the White’s emerging victorious with a 2-0 win, Erlend Ballantyne scoring both goals. In the last matches of the group the White’s won 3-0 against Spurs with the goals coming from Erlend Ballantyne, Jamie Tulloch & Scott Rosie. This ensured that the White’s would top the group. The attention then turned to the Yellows against Whitedale, with the Yellows knowing that they had to win to have a chance to qualify. They did just that with a 2-0 win against Whitedale, with the goals coming from Ewan Foubister and Dominic Barnby. Orkney White’s then played Lerwick Rangers in the semi-final which after some good play by both sides, the game finished goalless. After some tense moments and great saves by Scott Rendall in the White’s goal, the White’s won the penalty shootout 2-1 to move into the Final. Orkney Yellows faced Orkney Reds in the other semi-final with the Red’s proving to be too strong with a convincing 3-0 victory with goals from Nairn Hall, Jason Scott and Archie Aitkinson. For the second year in a row, the final was contested by two Orkney teams. An excellent match between the two sides saw the Red’s creating the better chances but with some inspired goalkeeping from Scott Rendall in the White’s goal the scored remain goalless at full time. The penalty shootout decided that Orkney Whites would win the cup 3-2 on penalties. This was an excellent performance by all the Orkney teams, with all 3 teams qualifying for the Semi-finals. The Reds and Whites also managed not to concede a single goal in open play throughout the whole day. 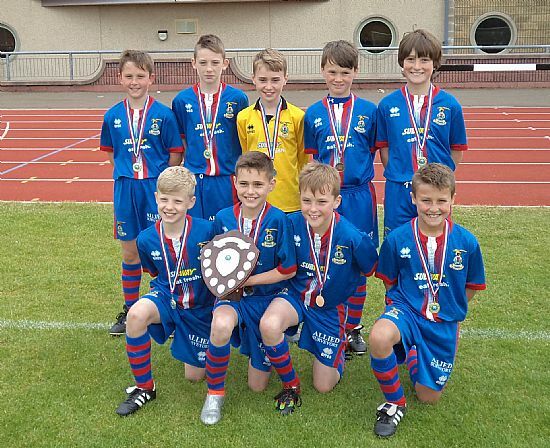 For the second week in a row Inverness Caley Thistle emerged victorious from Orkney after winning the Littlejohn Removals Shield at Picky on Saturday 18th June. 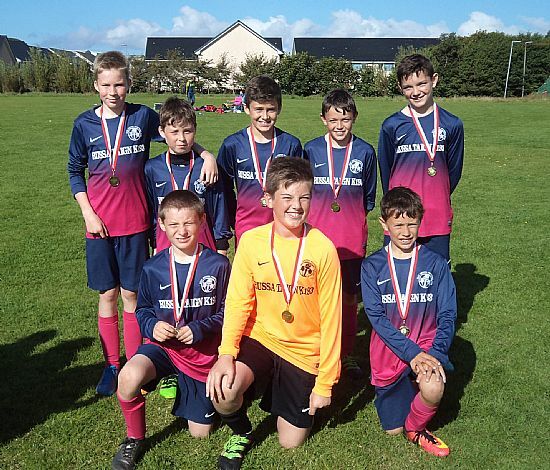 Following the success of their Under 12's side on the previous week it was the turn of the Under 11's side last weekend. In an eight team 7-a-side league Caley Thistle claimed first and second places with Shetland Blue in third spot. The winning ICT Blue team won six of their seven matches, finishing just 3 points ahead of their teammates. After the competition Roddy Mackay representing OYDG thanked the travelling clubs for supporting another exciting day of youth football in Orkney. He also thanked the referees for the day Liam McArthur, Lennie Merriman, Graeme Leask and Graeme Harrison. He then handed over to competition sponsor Shaun Littlejohn who presented the Littlejohns Removal Shield to the winning Caley Thistle captain. 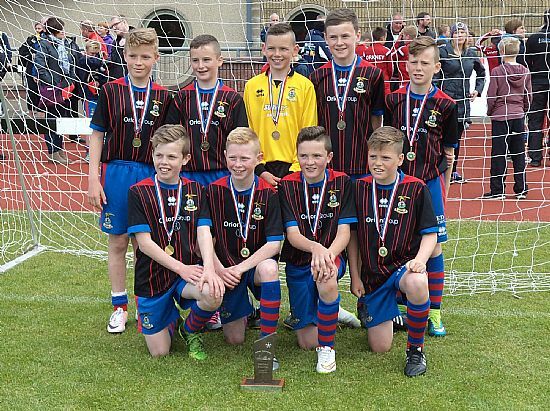 Inverness Caley Thistle proved too strong for the opposition as both their teams made it through to the final of the Under 12’s Northern Counties Tournament played at Picky on Saturday 11th June. 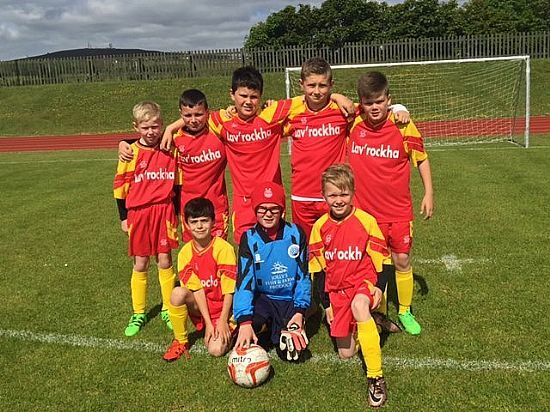 The Inverness teams won their respective groups winning all their games before they both narrowly defeated Ross County and Orkney White by 1-0 scorelines in closely fought semi-finals. In the final ICT Black beat ICT Blue 2-0 with two second half goals to secure the trophy for the first time in four years. The Orkney sides performed very well in today’s competition. 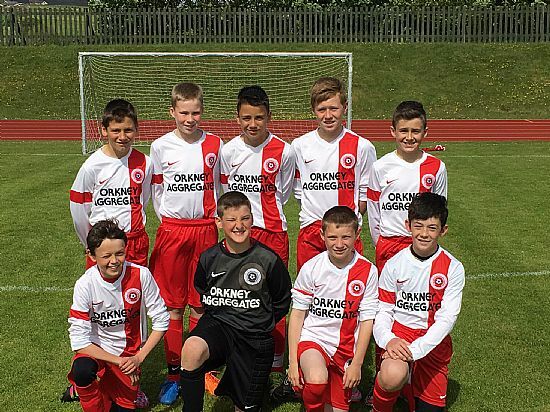 The Orkney White team in particular put in an excellent display reaching the semi-finals and over the course of the day’s play only lost twice – both by narrow 1-0 margins against the two Caley Thistle teams. Graeme Harrison on behalf of OYDG thanked the visiting teams at the end of the competition and presented the trophy and winners medals to the winning Caley Thistle team. 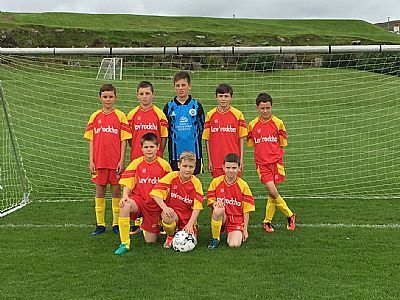 On Sunday a combined Orkney/Shetland team played Caley Thistle in an 11-a-side friendly match with the Shetland team playing the first half of the match and Orkney the second. The final result was 3-0 to Caley Thistle with a first half and two second half goals securing the victory. At the end of the match the Orkney Player of the Weekend chosen by the Caley Thistle coaches was Archie Atkinson. ICT White 4 Shetland White 0; Caithness Red 1 Orkney Red 0; Ross County 1 ICT White 2; Shetland White 1 Caithness Red 4; Orkney Red 0 Ross County 4; Caithness Red 0 ICT White 2; Shetland White 0 Orkney Red 0; Ross County 3 Caithness Red 0; ICT White 8 Orkney Red 0; Ross County 4 Shetland White 0. Orkney White 2 Shetland Sky Blue 0; Shetland Blue 0 ICT Blue 3; Caithness Black 1 Orkney White 3; Shetland Sky Blue 0 Shetland Blue 1; ICT Blue 5 Caithness Black 0; Shetland Blue 0 Orkney White 1; Shetland Sky Blue 0 ICT Blue 2; Caithness Black 0 Shetland Blue 2; Orkney White 0 ICT Blue 1; Caithness Black 0 Shetland Sky Blue 1. 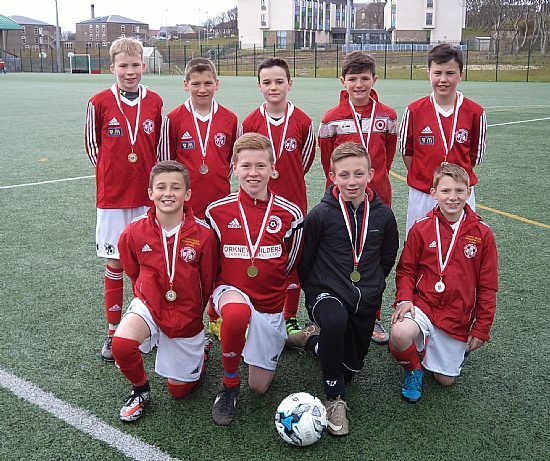 There was an excellent turnout of 16 teams involving over 160 players at the annual 7-a-side tournament, with visiting Shetland club Whitedale played at the KGS All Weather Pitch on Saturday 30th April. This included three teams from the visitors and a first appearance from Kirkwall side Wanderers who have just established a youth set up. Two leagues were played and after 4½ hours of exciting and closely fought football matches both leagues were decided in the closing matches. The tightness of both leagues was reflected in the unusually high number of goalless draws with half of all the matches played on the day ending up in 0-0 scorelines. In the A League Stromness A went into their final match against Dounby A needing a win to pip East United A to the league, but their west neighbours defended well and held out for a goalless draw to hand the title to East by a single point. As the only club to finish the league undefeated and not concede a goal, this was a deserved victory for East. East Utd A 1 Whitedale A 0; Thorfinn B 0 Stromness A 1; East Utd B 0 Dounby A 0; Stromness A 4 Whitedale A 0; Dounby A 0 Thorfinn A 0; East Utd B 0 Thorfinn B 0; East Utd A 1 Stromness A 0; Whitedale A 1 East Utd B 0; Thorfinn A 0 Thorfinn B 4; Dounby A 0 East Utd A 0; East Utd B 0 Stromness A 1; Thorfinn A 0 Whitedale A 0; East Utd A 3 East Utd B 0; Dounby A 0 Thorfinn B 0; Stromness A 1 Thorfinn A 0; Thorfinn B 0 East Utd A 0; Thorfinn A 0 East Utd B 0; Whitedale A 1 Dounby A 0; East Utd A 2 Thorfinn A 0; Thorfinn B 1 Whitedale A 0; Dounby A 0 Stromness A 0. The B league also went to the final match with Dounby B needing a victory whilst opponents Thorfinn C needed a draw to secure the title. Thorfinn rode their luck with Dounby hitting the crossbar from a deflected shot as they piled on the pressure, but the Kirkwall team held out for a goalless draw to secure the vital point. 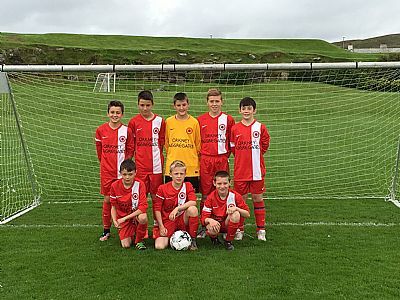 For the Shetland visitors, the Whitedale B team performed very well and were the only unbeaten side in the B League finishing in second place. It was also a very promising start for newcomers Wanderers who won three of their matches and finished a very creditable fifth place in the B League. East Utd C 1 East Utd D 0; Dounby B 0 Thorfinn D 0; Wanderers 0 Whitedale B 0; Stromness B 0 Thorfinn C 0; Whitedale B 1 Whitedale C 1; Wanderers 0 Stromness B 1; Thorfinn D 0 East Utd C 0; Wanderers 1 Thorfinn D 0; Thorfinn C 5 East Utd D 0; Whitedale C 0 Dounby B 1; Whitedale B 0 Stromness B 0; East Utd C 0 Thorfinn C 2; Thorfinn D 0 Whitedale C 0; East Utd D 0 Whitedale B 4; Wanderers 1 Dounby B 0; Dounby B 0 Stromness B 0; East Utd C 0 Whitedale C 0; Thorfinn C 0 Whitedale B 1; Thorfinn D 0 Stromness B 2; East Utd D v Dounby B; Whitedale B 0 East Utd C 0; Stromness B 0 Whitedale C 1; Dounby B 0 Thorfinn C 0; East Utd D 1 Thorfinn D 5; East Utd C 0 Stromness B 0; Whitedale B 0 Dounby B 0; East Utd C 1 Wanderers 0; Whitedale C 1 East Utd D 0; Thorfinn C 0 Thorfinn D 0; Dounby B 1 East Utd C 0; Wanderers 4 East Utd D 0; Thorfinn C 1 Wanderers 0; East Utd D 0 Stromness B 5; Wanderers 0 Whitedale C 0; Thorfinn D 0 Whitedale B 1; Thorfinn C 1 Whitedale C 0. At the end of the competition, Joseph Coyle (OYDG Secretary), congratulated all of the teams on the standard of their football and thanked the referees and the Whitedale players and coaches for coming to Orkney for another enjoyable day of football. 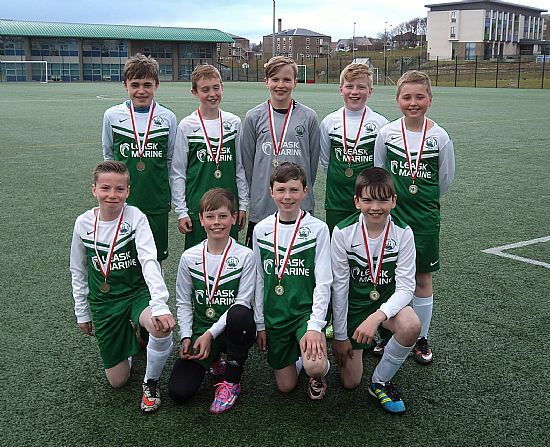 The winners medals were then presented to the winning teams – East Utd A and Thorfinn C.